Pablo Sandoval of the Giants is Wednesday's Player of the Day. Sandoval hit three home runs, drove in six and went 4-for-5 in the 13-5 win over the Padres. David Ortiz is American League Player of the Day. Ortiz hit two home runs, drove in four and went 3-for-5 in the 20-4 win over the Tigers. Ortiz rises to 23rd place on the season's Box-Toppers player rankings. He earns 1.7 Box-Toppers points for being AL Player of the Day, giving him 12.4 for the season. Wednesday was a rare occurrence in which batters earned both top player honors over pitchers. Notable: Yankees closer Mariano Rivera earned Player of the Game honors for the second straight day. Rivera (1.1IP 0H 0R 1K Sv in 6-5 win vs. White Sox) earns 1.0 Box-Toppers point, giving him 4.0 for the season. Rivera now has 125.4 career Box-Toppers points and is in 26th place overall. However, he trails the all-time leader among closing pitchers, Trevor Hoffman, who earned 129.4 points and is in 21st place overall. Rivera, who has announced he is retiring after this season, would need to double his season total in Box-Toppers points over the next few weeks to catch Hoffman in career Box-Toppers points. 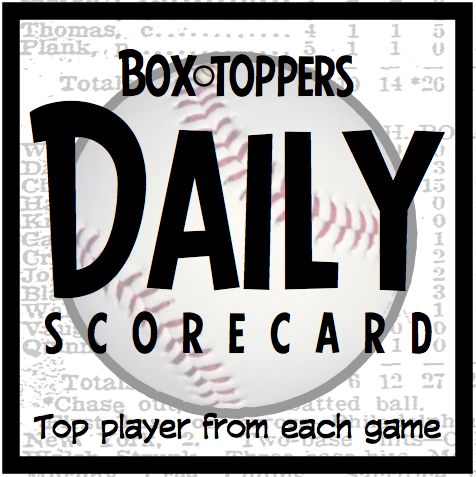 Ortiz, who was AL Player of the Day Wednesday, has 126.4 career Box-Toppers points and is in 24th place. Box-Toppers record-keeping began in 1995. Sandoval receives 2.0 Box-Toppers points for being Player of the Day. Ortiz receives 1.7 for AL Player of the Day. No pitchers received Box-Toppers bonus points since no pitchers had higher Box-Toppers game scores than the top batters.